I mentioned a few weeks ago that one of the three holidays we celebrate here at Studio Arrabbiata is St Joseph's Day, with March 19th being the feast day for St Joseph, who is the patron saint of Italy, of people who work with wood, of dessert bakers, and I'm sure many other peoples. For Italians one of the customs for celebrating this day is enjoying a nice filled zeppole, stuffed with cannoli cream or whipped cream, etc, and often I have done that, but I didn't find any in the places I went today. 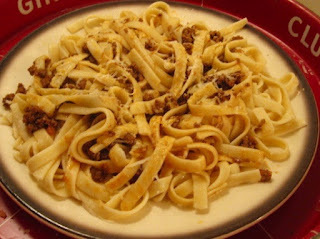 So maybe no fancy dessert, but a nice Italian dish of pasta is always available in my kitchen, in this case fettuccine with a family recipe meat sauce that goes very well on this dish, plus lots of freshly grated imported pecorino romano cheese. Followed up with some cookies. Actually, thinking about it, there may be four holidays that we celebrate, when you throw in Selection Sunday, which occurred a few days ago, the day when this year's NCAA men's basketball tournament bracket is announced. May not be an official holiday on most calendars, but one surely celebrated in offices all around the country. In the next day or two I'll have my annual NCAA tournament of art announced, schools that will be playing basketball in the big tournament that are also schools where I have some kind of art connection. Maybe I'll get that done tomorrow.